The club site has now been cleared following the recent construction work, which means all will be ready for the start of our Steam/Open Day season in April 2010. Once again we would like to apologise for any inconvenience caused by the, cancellation of the August & September Steam Days, and look forward to seeing you next year. The second day of our 54th Annual I & WEMRC Exhibition. The first day of our 54th Annual I & WEMRC Exhibition. Due to building construction work being carried out, it is unsafe to allow any non-club member to be on site at present. Therefore no Steam/Open Days will take place until the work is finished an the site cleared of any hazard. We regret and apologise for any inconvenience or disppointment this may cause, and hope to have the site cleared ready for the start of next year's season in April 2010. 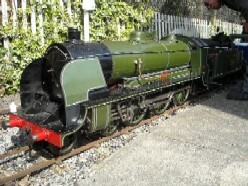 Following the derailments we suffered on our last Steam Day, Excalibur suffered damage both to the braking system and to one of the front wheels. This has all now been fully repaired, and we hope to give it a test run this coming weekend. Unfortunately, however, we are unable to open to the public at the beginning of August, see above. Our fourth steam of the 2009 season didn't go quite according to plan. Unfortunately an early derailment caused some damage to our locomotive Excalibur, and although we were able to get it repaired and re-steamed, we suffered similar derailments each time. This meant we had to take the decision to suspend rides for the rest of the day - our apologies to all visitors for any disappointments, and thanks for your patience while we tried to get the loco running again. Paul and David Middleton of Ride On Railways kindly invited us spend an evening playing trains (there's no other way to describe it!) 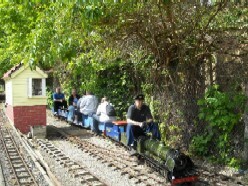 in their magnificent garden railway. 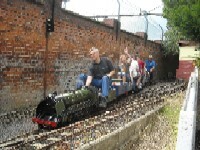 There is nothing quite like the sight of half a dozen grown men (if railway enthusiasts can be ever be called that!) 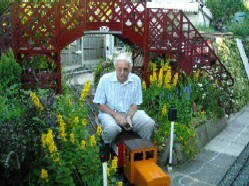 whizzing around a garden astride battery powered electric trains. Many thanks to the Middletons for their hosplitality and for an evening of pure fun. 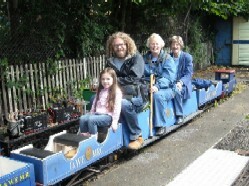 Our third steam of the 2009 season opened with the visit of some important guests - the family of Dr Watts, the original owner of our steam locomotive Excalibur. 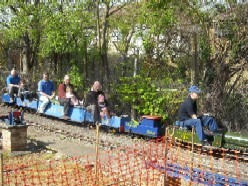 The first train of the day had the distinction of carrying four generations of the Watts family! Our second 2009 steam day was another very busy one, with good weather and plenty of familar faces as well as some welcome new ones. club member Len Dewell, who in the early 1990's was instrumental in expanding the club facilities to include the library, kitchen and toilets. Our 2009 season got off to a good start, with fine weather and a steady stream of visitors, both regulars and some new faces. A bit different from last April. 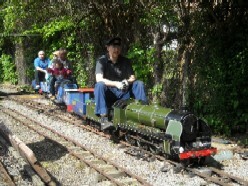 Our our GWR club layout Taw Magna was invited to the Kettering G.O.G. on 07 March and we had a very successful and enjoyable day. Gethin Williams made us most welcome. Everything ran smoothly with only the odd mishap caused by human error - either failing sight or hands too large! After sorting out an electrical gremlin shortly before opening, the layout performed well. We operated in two sessions: up to lunch time we paraded a GWR theme, whilst in the afternoon we ran the layout as BR (GW) steam. We also have enough members' stock to run a fully dieselised service to a distinctly GER flavoured motive power if required.